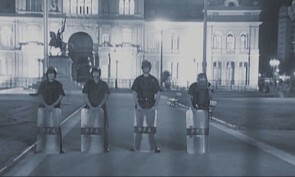 December 2001, Buenos Aires. People flock to the historic square, Plaza de Mayo. Argentina, once amongst the richest economies in the world, has gone bankrupt. The Government has resigned and the President, Fernando de la Rúa, leaves the Pink House in a helicopter amidst a storm of violent clashes that left a toll of 35 dead and over 20 million people (half the population) submerged in poverty. Almost 10 years later, the Greek documentary-maker Yorgos Avgeropoulos, who worked in Argentina during the crisis, returns to carry out a new autopsy of the country’s economy, its political and social situation. Sometimes the tale of what happened there a decade ago looks a lot like the situations taking place today in some European countries.